Are you into needlecrafting? Making great applique designs? Embroidery? 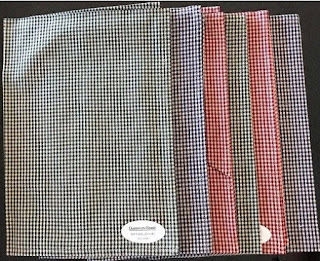 Then our pack of six Dunroven House tea towels is for you and better, it is on sale for $24.50. That is $4.08 per tea towel only which normally normally retails for $7.50 per towel. Dunroven House tea towels are great for embroidery, appliqued designs and sewing. They are made of 100% cotton and has a twill tape in a corner for ease of hanging. Or you can use them literally as your tea towels. They are washable and dryable. Pack of 6 comes in 3 mini check colors : Blue, Red and Green. Click on the image above or click here to check it out.